You control an explorer who was shipwrecked on an unknown island, being the sole survivor of a plague that killed both the captain and crew. The narrative is told in 1st person from his perspective as you progress through the entries written in his diary. The game begins with your explorer who mourns the death of his crewmates from the plague while sitting on the ship’s deck. From his first log date on September 4th, 1846, he hopes to return home to his wife and show her the diary. Realizing he is alone, the explorer decides to climb up to the edge of a steep cliff. From there, you must figure out how to make him survey the island using his spyglass and telescope. If you complete this small task, you are rewarded with a brief flashback of his departure from England. Then, he decides to see if there are any survivors still aboard the ship. Standing on the main deck, he can either enter the cargo hold, the captain’s quarters, the galley, or the sick bay to assess the conditions of the ship. Later on, he follows a branching path into a thicket of breadfruit trees. The jungle is full of dense foliage but he follows the footprints to avoid getting lost. Eventually, he sees some natives in the distance but is too frightened to approach them. Honestly, nothing good ever happens to this guy. He injures his leg among fallen rocks and is forced to carry a rotting wound for the rest of the game. The explorer aboard the Mayflower to recover a bit but soon realizes he must escape with the dinghy. 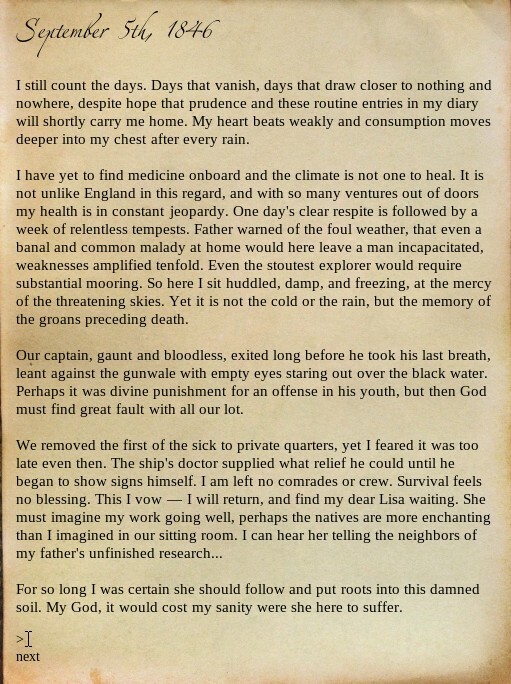 There are different stages in-game shown as dated entries in the diary or as past memories recalled by the explorer, back when he was more optimistic about the voyage in search of new land. There are walls of text to read but no images as far as the eye can see. You’ll have to use your imagination and solve many puzzles similar to those point-&-click escape games. The words are typed in a sequence which strings them together to produce an action as I will demonstrate. 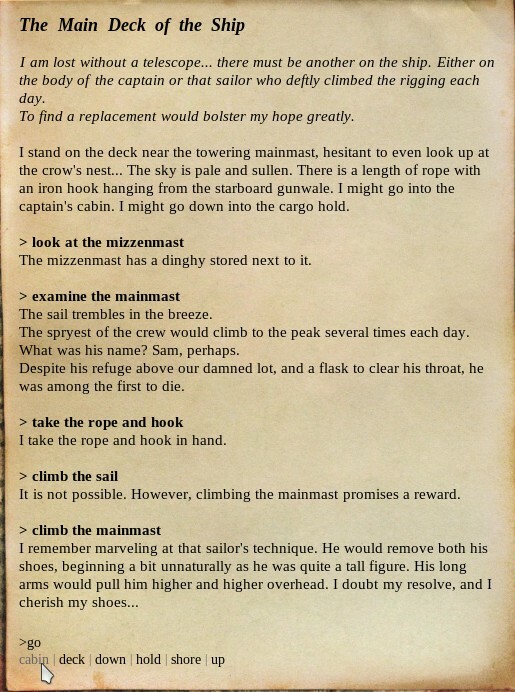 If you type in “go”, several choices are presented to you as to where to go including the shore, cabin, and up the mainmast. Picking “Up” leads to more buried sub-actions. The controls of Mainland are fairly basic: You just type words and click on the ones available. Right-click clears your inputs. To scroll up/down a page, use the mouse wheel. Escape lets you save/load your game. During the story bits, you can click next just like how you would read an e-book. Sometimes, the correct thing to do is not obvious. You are bound to get stuck typing the letters from A to Z until you find words that make sense to input in your explorer’s situation. This is simply because people have different ways of finding solutions. Although the context of a situation is given, you may not remember all of your possible options. This forces you to determine the most logical action through trial and error which is quite tedious. I still think the Devs should add hints to guide players who are really lost. You’ll probably need a walkthrough to complete this one. It’s a good idea to complete the tutorial lab game in order to understand how to write proper commands that help you achieve your goal. I did have fun with it by ordering the explorer to do pointless things like setting alight the sail with matches, moving the paintings in the captain’s room, pulling off his shoes, or drinking the whiskey. Too bad he is a total bore and won’t listen to me. It was still hilarious nonetheless to read his reaction to jumping off the cliff and other commands including approaching the natives that he assumed were savage cannibals. At least he knows when you are obviously screwing with him. Because you’re advised against making bad decisions that could kill you, it’s impossible to lose the game! Besides, the guy will actively prevent himself from doing actions that aren’t plausible in real life. Honestly, for a text adventure, I enjoyed what little art they had as it appeared to be pencil sketches. But seriously, the game could use a lot more visuals to show the player what the hell is actually going on. To be honest, adding sound effects would drastically enhance the actions you partake in. The absence of images, not a single rough sketch of the island was disappointing because you aren’t given any clues on how to move forward in the story. It does have an ending open to one’s own interpretation. But I won’t spoil it for you; play it yourself to find out! 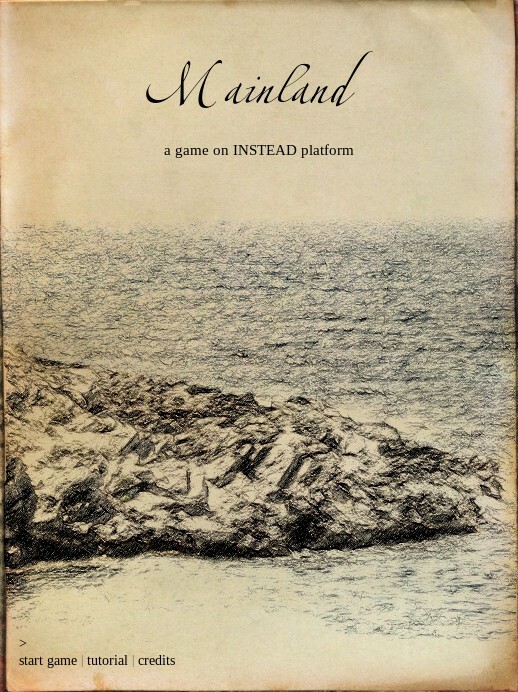 The story of Mainland had very vivid details and immerses the player in a shipwreck situation. The background piano music by Kevin Macleod is easily its strongest point. The parchment is a nice touch since we are reading the protagonist’s diary entries. The gameplay style is solid but the execution of a command system needs work. From a certain standpoint, Mainland isn’t half bad for an adventure novel, however, I still wouldn’t call it a game. Are you completely stuck or have no idea what to do next? Check out the entire walkthrough to Mainland on Steam.